Welcoming the news that Russia and the United States have reached an agreement on a framework for Syria to destroy all of its chemical stockpiles, United Nations Secretary-General Ban Ki-moon has also announced the Syrian Government's formal accession to the international treaty on banning chemical weapons, effective 14 October. A statement issued by his spokesperson in New York confirms that the Secretary-General, in his capacity of the depositary of the 1992 Convention on the Prohibition of the Development, Production, Stockpiling and Use of Chemical Weapons and on their Destruction, today received the formal instrument of accession to the treaty by Syria. “The Convention will enter into force for [Syria] on the 30th day following the date of deposit of this instrument of accession, namely on 14 October 2013,” the statement says, adding that the Convention can be acceded to at any time and that the UN chief welcomes Syria's decision. In a separate statement released earlier today, Mr. Ban welcomed the agreement reached by Russian Federation Foreign Minister Sergey Lavrov and United States Secretary of State John Kerry on a framework for the safeguarding and destruction of Syria's chemical weapons stockpiles. Announcement of the deal came after three days of intense talks in Geneva, Switzerland, between Mr. Lavrov and Mr. Kerry. It culminates a week of diplomatic activity noted by the media, kicked off earlier by the announcement of Russia's proposal for Damascus to surrender its chemical weapons and place them under international control. On Thursday, a UN spokesperson confirmed that the Secretary-General had received a letter from the Damascus informing him that Syrian President Bassar Al-Assad planned to sign and abide by the Chemical Weapons Convention. In the meantime, evidence collected by a UN team probing possible chemical weapons use in Syria on 21 August is being examined by laboratories in Europe. The team, which the Secretary-General has said is “working around the clock,” is expected to submit its report to him in due course. In the statement issued today, Mr. Ban looks forward to learning more of this framework agreed by Russia and the United States and pledges the support of the United Nations in its implementation. “The Secretary-General expresses his fervent hope that the agreement will, first, prevent any future use of chemical weapons in Syria and, second, help pave the path for a political solution to stop the appalling suffering inflicted on the Syrian people,” says the statement. 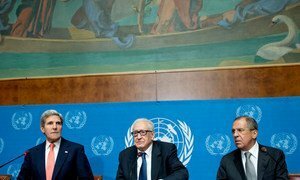 As for talks on a political path out of the more than two year crisis, United Nations-Arab League Joint Representative Lakhdar Brahimi has been pressing ahead with his efforts towards the holding of a long-proposed international peace conference on Syria, commonly referred to as “Geneva II”, after the Swiss city in which it would be held. Pressing ahead with his efforts secure a diplomatic solution that would end to more than two years of bloodshed in Syria, United Nations-Arab League Joint Representative Lakhdar Brahimi hosted a meeting between senior officials from Russia and the United States on devising a political path forward, in Geneva today.